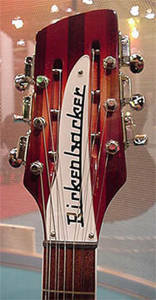 Rickenbacker® Model 360/12C63 from the NEW C-series! 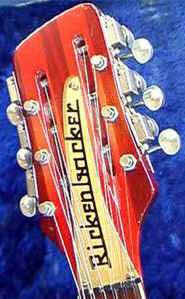 There is also a big difference in the shape of the headstocks! 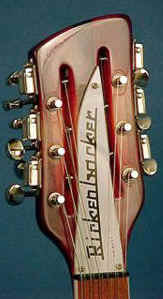 THE ORIGINAL MODEL360/12 FROM 1963! 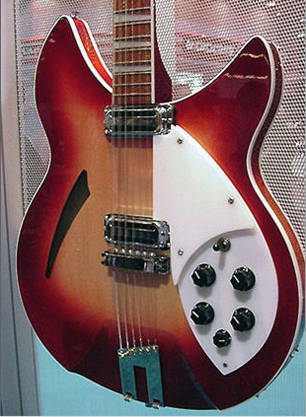 February 8th, 1964 was a day when Rickenbacker (read Francis C.Hall) really made a very powerful contribution to the sound of the sixties.That day Mr. Hall invited The Beatles (John, Paul and Ringo) to his hotel suite at the Savoy Hilton Hotel in NYC.There he showed them his newest "invention", the electric twelve-string.George Harrison, who was back at the Plaza Hotel, had the flu and stayed in bed.The other boys wanted to give him a chance to try out this new guitar, so off they went to his hotel.George, who was giving a telephone interview for the radio station WDGY in Minneapolis, tried out this new guitar.When he told the DJ about the guitar the radio station offered him the instrument as a gift.But Francis C. Hall had already decided to give away this instrument, and so he did. Photo © 2001 RIC. All rights reserved. Used by permission.